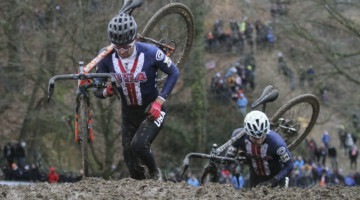 On Sunday at 8:00 am EST, the Elite Men’s Race at Tabor will get underway, with the American Men’s Team ready to show their depth of talent, including a front row start line position by Jeremy Powers. Many already have a World Championship Race under their belt: all of them but one. Today we give take a look at the newest force of the American men, none other than Stephen Hyde. 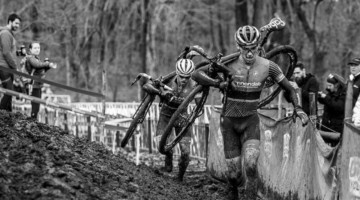 Stephen Hyde: The newest face in Elite Men’s Cyclocross in America, the once little known-rider who out-sprinted then National Champion Jonathan Page in Baltimore a year-and-a-half ago, the racer who posted-up for four wins this season (Nittany Lion, Charm City CX, the KMC Cyclo-Cross Festival, and Cycle-Smart International) and another two podiums against more experienced professionals. Hyde is the only “new” face on an American Men’s Worlds roster full of international veterans. I caught up to Stephen just before he rode the Hoogerheide World Cup. There he spent the first part of the race fighting for a spot inside the top-20 before finishing at 37th place. At first glance, it is easy to pigeon-hole Hyde into a sort of easy-going and worry-free character: someone who tattooed a pizza slice on his leg and, until this season, sported scraggly sideburns. Someone who will almost always crack self-deprecating jokes during interviews and explains that winning a UCI race is like “getting the biggest, nastiest booger out.” Someone who simply doesn’t take life too seriously. This humorous, affable side of Stephen Hyde, however, gives only part of the picture. It is easy to see his amiable nature, excited post-race interviews and goofy tattoos and picture someone propelled to the top of the sport thanks to talent and a little bit of luck. Such a view ignores the commitment that Hyde has devoted to his trade under the tutelage of Alec Donahue and JAM Fund racing over the last two years. 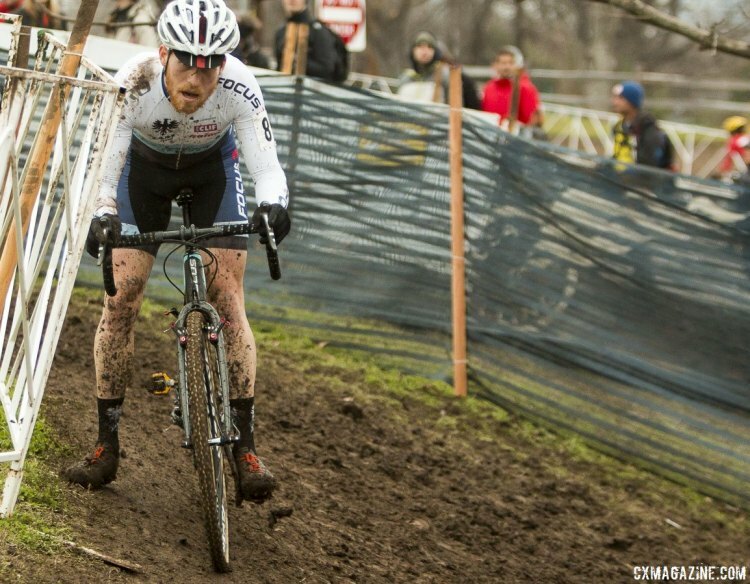 In many ways, Hyde’s journey to the top of American Cyclocross seems counter to his appetite for adventure. Daily training plans, proper diet, and a rest and recovery regimen don’t come naturally to Hyde. Throughout his childhood and into his adolescence, Hyde was a roamer, even a sort of nomad. From Florida, to Oregon, to Martha’s Vineyard, to Washington, D.C., to East Hampton, Massachusetts, Hyde has not spent much time in one place or devoted to one thing. On the other hand, Hyde has been turning the cranks on a bicycle since his youth. Pretty soon his passion for bicycles exceeded its utilitarian roots. “I learned that bikes could be used to push myself as well,” Hyde said, “and I started BMX pretty young.” It is not an entirely atypical entry into the sport, but even from a young age Hyde and his friends seemed to fly higher, to go bigger than their peers. Whether by nature or nurture, going out of his comfort zone became a recurring theme in Hyde’s eclectic life. Traveling with his BMX buddies every weekend led to selling all of his belongings and taking a three month cycling trip to Oregon. “[That trip] really changed a lot about me,” Hyde said. Among other things, it introduced, or perhaps re-introduced, him to his love for competition. That winter Hyde moved down to DC to race in the MAC series. 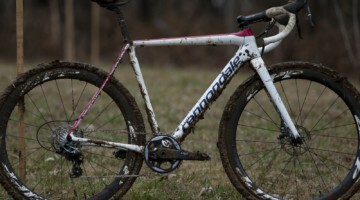 On a borrowed commuter bike he entered his first race and quickly discovered he had a natural aptitude for cyclocross. 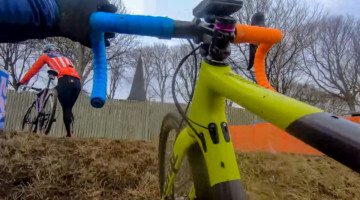 By the end of the year he upgraded to Cat 2 and bought himself a dedicated cyclocross bike. Within the same day he showed his talents in that race, Hyde was asked to join the JAM Fund team and has remained in the fold of their impressive development program to this day. Any hesitancy that Donahue had about Hyde has long since disappeared. Hyde had lived with Donahue for a spell and still spent hours at his house. Above all, Hyde had developed complete faith in Donahue’s coaching abilities and Donahue faith in Hyde’s ability to follow his plans. 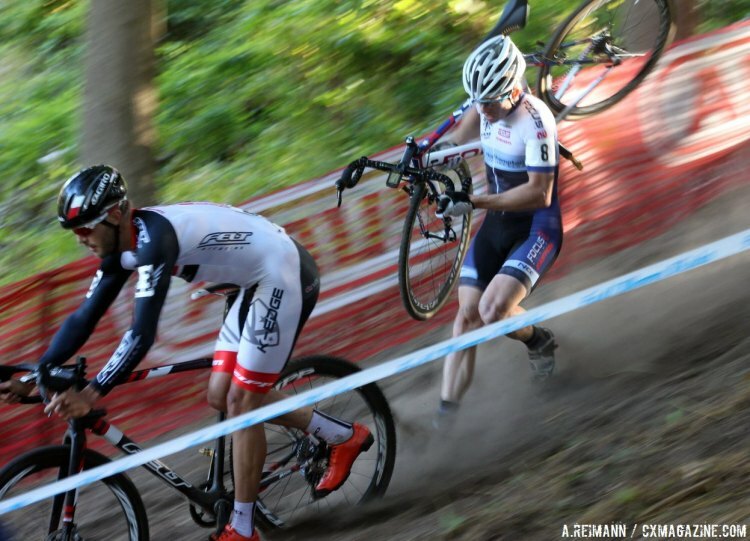 With a handful of wins to his name, a spot on the Worlds team, and his impressive commitment to getting better, I imagine that JAM will happily surrender him to a professional cyclocross team before long. Continue reading our profile of Stephen Hyde on page two.